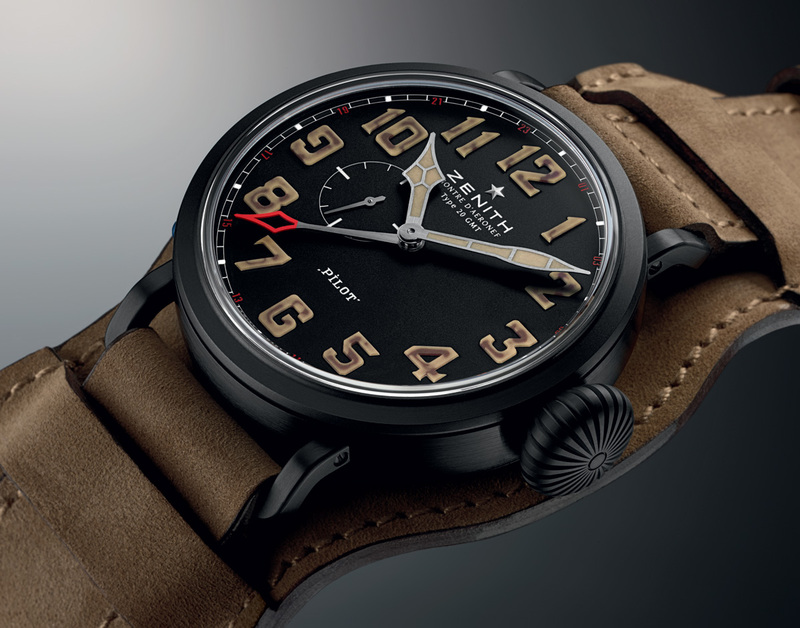 Created to commemorate aviation pioneers the Wright brothers and their 1903 flight, the new Pilot Montre d’Aéronef Type 20 GMT 1903 is a limited edition with a DLC coated titanium case and faux vintage Luminova. In December 1903, the Wright brothers took to the air in their wood and fabric aircraft at Kitty Hawk beach in North Carolina, USA. Over several attempts they eventually flew several hundred feet, making aviation history. 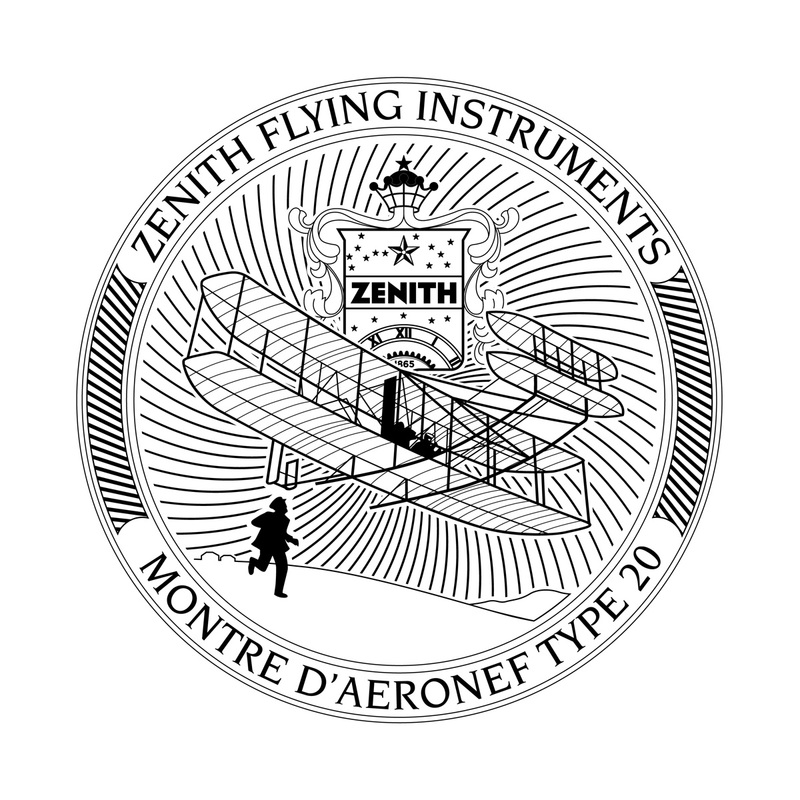 Zenith commemorates this event with the new, limited edition Pilot Montre d’Aéronef Type 20 GMT 1903. Based on the ordinary Type 20 GMT, the 1903 edition has the same second time zone function which is advanced in one hour increments with the pusher at 10 o’clock. However, it differs from the regular edition in two key aspects. One is the case, which is diamond-like carbon (DLC) coated titanium. The Pilot Montre d’Aéronef Type 20 GMT 1903 has the same 48 mm case as the rest of the Montre d’Aéronef Type 20 line, which includes the Type 20 Annual Calendar and even a tourbillon chronograph. Though large the case sits well on the wrist because of the short and downward angled lugs. The other detail unique to the 1903 edition is the dial, which has faux aged Luminova. 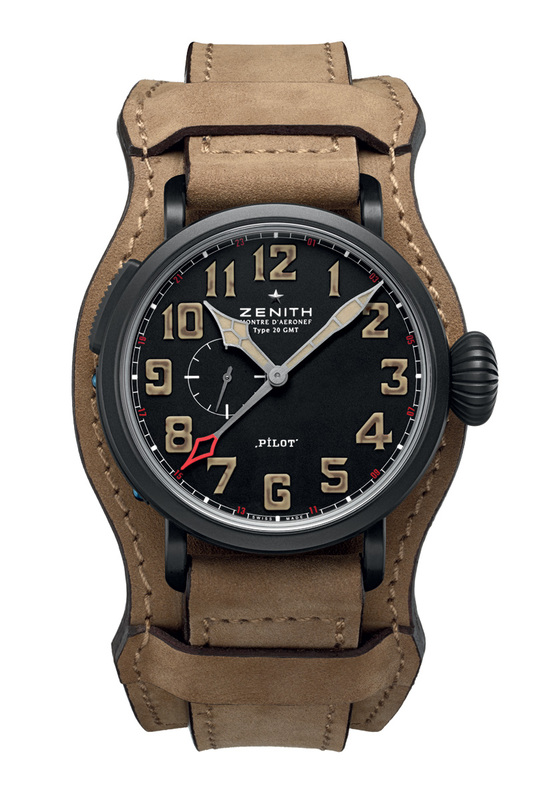 Zenith calls this “old radium” as it is meant to recall the colour of aged radium dials from the early twentieth century. This effect is created by first printing the numbers in “old radium” style, creating the variegated brown marbling, followed by applying ivory-coloured Luminova on top. The “old radium” lume is somewhat affected and artificial, but it goes well with the aesthetic of the watch. Inside is the Elite cal. 693, which is essentially the El Primero movement with the chronograph mechanism removed. The cal. 693 is automatic with a 50 hour power reserve. The solid case back has a stamped relief depicting the Wright brothers on their 1903 flight, with Orville on board the aircraft and Wilbur running alongside. 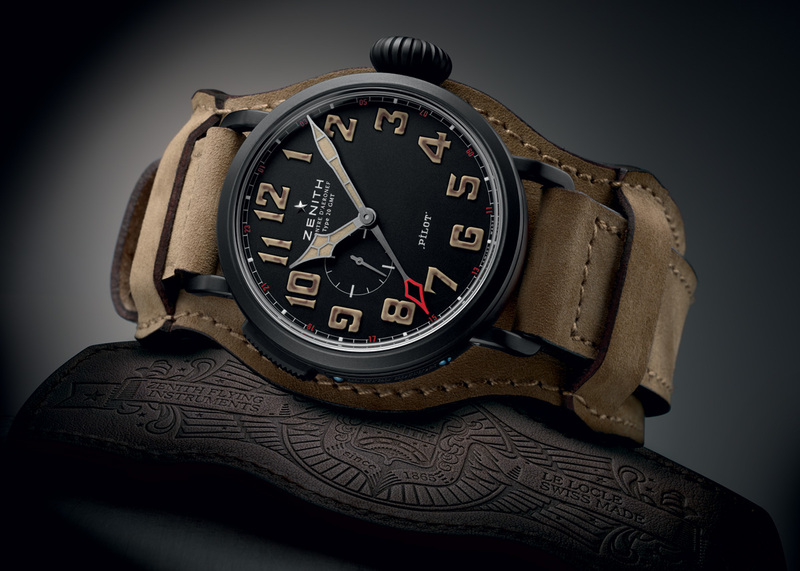 The Pilot Montre d’Aéronef Type 20 GMT 1903 is presented on a tan nubuck strap with a back pad, a style borrowed from the so-called Bund straps (short for Bundeswehr, or Federal Defence) used by the German airforce. 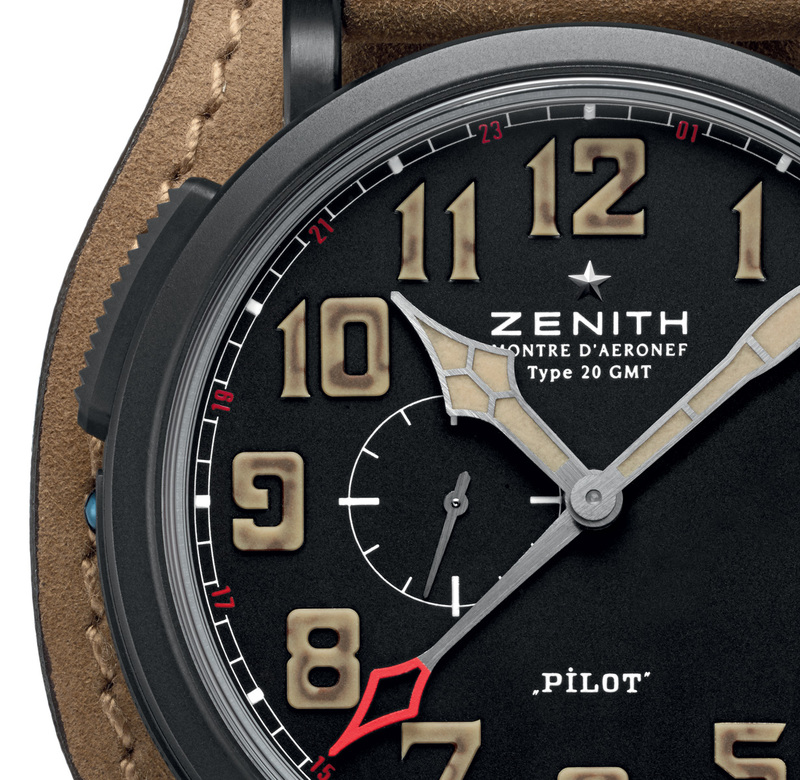 The purpose of the back pad is to prevent the watch case back, which can get uncomfortably cold at high altitudes, from touching the pilot’s wrist. Limited to 1903 pieces, the Pilot Montre d’Aéronef Type 20 GMT 1903 has a retail price of 7800 Swiss francs before taxes, equivalent to about US$8600. – SJX Follow us on Facebook, Instagram and Twitter for updates and news.